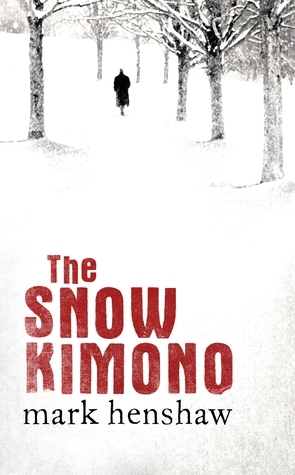 Review: The Snow Kimono | Live to read. Read to live. Well, I’ve never read any of Mark Henshaw’s stuff before this one, which appealed to me for the main part I think because it’s set (partly) in Japan, and Japan says to me Murakami, which in turn says to me yes. That was pretty much it, really, initially. I read the blurb (and did a small grin to myself because the main chap’s called Jovert which obvs put me in mind of Javert of Les Mis fame) and thought yep, this is a book that sounds like me. The premise is this: Retired police inspector Auguste Jovert gets a letter from a woman who says she’s his daughter and then goes home to find an old Japanese chap waiting in his apartment. He begins to tell Jovert a story of love and loss, of friendship and betrayal and of The Snow Kimono from the title. Professor Omura’s story is eerily similar to the tale of Jovert’s own life – also a story of love and loss, friendship and betrayal and ultimately built around a lie so you know, you have Omura's story and you have Jovert's story and you have all the parallels and it's all going on against these really excellent backdrops of Japan and Paris and Algeria. I know, sounds fascinating, right? The thing about The Snow Kimono is it's interesting because it’s a story within a story; Jovert’s story is playing out in the background as he spends time with Omura who tells his story, essentially that of his life with this guy called Katsuo Ikeda (a writer, with the same initials as Kazuo Ishiguro. Also there is a character in the book called Mr. Ishiguro. An intentional tip-of-the-hat? I reckon so! ), who I guess you’d call Omura's friend but I’m not entirely sure that’s accurate. It’s a book that's all about seeing yourself how other people see you I think, at it’s heart, an exploration of identity and perception and the reliability of a person narrating his own story. In Japan, we have a saying: If you want to see your life, you have to see it through the eyes of another. There’s a lot going on in this book and I mean a lot. So many layers, it’s like one of those giant delicious layer cakes. I am so bad at analogies good heavens, I just, those cakes always look so delicious and good and layered. That’s what this book is: delicious and good and layered and also incredibly fragmented. Like how a cake crumbles when you bite into it? DOES THIS STILL WORK (DID IT EVER?) Whatever, I’m running with it, leave me be. The way this book is written felt kind of familiar. Which, oh God, again with the no sense. I mean, Henshaw’s Australian, but the way he writes gives me the same sort of feeling I got when I was reading – for example – Norwegian Wood. I mean I’m not comparing Henshaw to Murakami, or even this book to Murakami’s work, it’s just that something about it felt familiar. I think it's perhaps something about the writing style; the imagery in this book, it’s so subtle and yet at the same time it kind of smacks you in the face you know? That, and the whole Japan of it all. Anyway, there was this sense of familiarity that settled over me as I read it, and I liked that. The descriptions are stunning, and so very vivid, particularly the parts of the book set in Japan. Those are the parts I felt most engaged with, to the point that I almost wished Jovert would go the same way as his almost-name-twin so that I could spend more time in Japan where the characters felt so real and the descriptions were so colourful and there was this awesome correlation between descriptions of like, nature and in fact the whole world Omura inhabited and the events that were unfolding. I loved it. I don't feel like I'm doing a very good job of this. This book is a hard book to review. I don’t quite know what to say about it, and that may well be because I am writing this review on almost zero sleep. I think I should stop trying and say that basically, it’s clever and it’s sort of poetic and it’s absolutely worth a read.